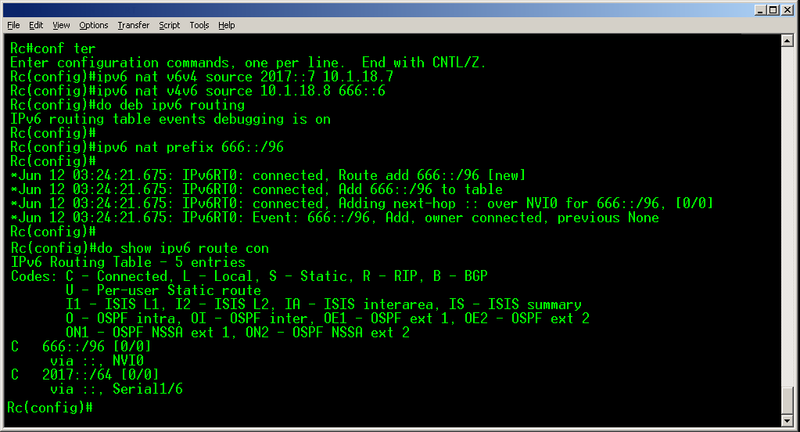 IPv6 address from the IPv6 domain are mapped to ipv4 addresses by the NAT PT device. We can perform ipv4 address mappings though a static or dynamic allocation. NAT-PT uses a /96 bit prefix to provide a pool of addresses for “virtual IPv6” IPv4 only nodes. The /96bits prefix is used because 32 bits are left to represent IPv4 nodes, and IPv4 uses a 32 bit addressing space. So a /96bit IPv6 prefix is enough address space to represent the entire IPv4 internet. This post is based on just Static NAT-PT Configuration (I will be posting Dynamic NAT-PT by Friday), and from this test we can say that static address mappings are useful in networks in which an internal IPv6 Node requires a stable mapping to an external ipv4 Device, such as access to an external DNS Server. 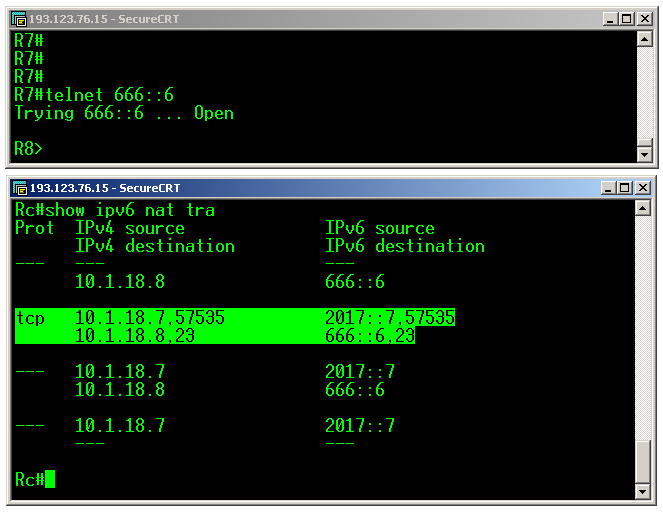 To enable NAT-PT use the command ipv6 Nat, on the interfaces that connects to the IPv6 Domain and also in the interface that connects to the IPv4 Domain. We can now use the command ipv6 nat v6v4 source ipv6address ipv4address and the ipv6 nat v4v6 ipv4address ipv6address to configure static mappings for ipv6 to ipv4 and ipv4 to ipv6 translations. 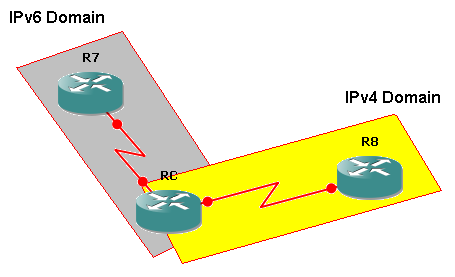 When a received IPv6 datagram matches against the NAT-PT prefix, it will be translated by the mappings that you configure, so this prefix would be used as the destination of traffic going from the ipv6 domain to the ipv4 domain, and from the ipv4 domain to the ipv6 would be the source of the traffic. Here we are going to create a secondary ip address on the connection with RC and R8 in order to have that ip reachable by R8, like in normal NAT this should be like the inside global. 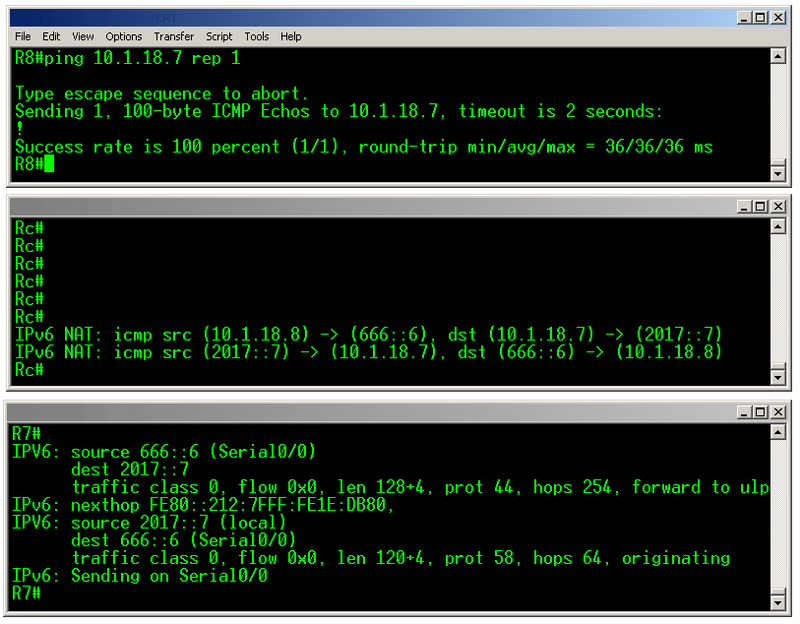 ← The BGP MED – Deterministic vs Always-compare. tin tin !! !